It is not the type of a call that an archaeologist receives every day. There are bodies, the voice on the end of the line told Anne Jensen; we don't know who they were, or why they are here. "People started noticing stuff eroding out of the bluff," she recalls, "and I got called out, along with the police, the real estate people and so on. "It was very clearly an archaeological burial. And the bluff was collapsing quickly, so we just got the contents out." The bluff lies virtually at the end of the Americas, on a narrow, hooked spit projecting northwards from Barrow. It marks the join of the Beaufort and Chukchi seas, and is prey to the temperamental vagaries of both. Now known as Point Barrow, the settlement on it was Nuvuk for at least 1,000 years, a spot presumably chosen because of its proximity to the migration path of bowhead whales which would become the cultural and nutritional centre of Nuvuk life. These bodies, these bones, clearly came from no crime scene. The police could leave, and Dr Jensen's team could get to work on a find more closely related to its own interests. It has been working every summer since. When I visit in late May, the spit itself is virtually invisible beneath the blanket of ice which carpets land and sea alike. 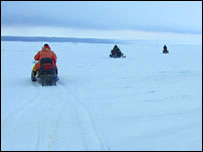 Led by Laura Thomas, we speed out on to the ice on snowmobiles, bodies swathed in heavy-duty parkas and feet wrapped in "bunny boots" which include a layer of air to insulate the delicate extremities. We traverse cracks created as the sea-borne ice rides up and down on the tide. We pass a couple of umiaq, traditional sealskin whaling boats left out on the ice, and every so often a scientific instrument or two, testimony to the extraordinary richness of Barrow's research tapestry. After perhaps 20 minutes we disembark at the point, the site of ancient Nuvuk. The higher level of ice is a clue that we are on land, and grey-brown late Spring melt mush materialises beneath our feet as we walk, to prove the case. Here, at the edge, is Anne Jensen's bluff, where bodies began appearing a decade ago. Or at least, here is where it is now; then it was 100 metres or so further out to sea. "We've had a lot of changing in currents over the past decade or so," explains Dr Thomas, "and with the changing currents and increased storm activity in the fall especially, it's undercutting the gravels and the point is literally washing out into the ocean." "It's eroding at about 20m per year; we only have an eight-week field season, and we need to cover at least 300m of shore," she says. "So it's salvage archaeology - we have to beat the erosion." The team uncovers about 20 complete burials each year. The methodology now involves digging exploration holes every few metres in a lattice pattern - "Swiss-cheesing", as Laura Thomas calls it - and excavating the newly identified burial sites. Most of the bodies were interred in a rough framework made of wood or whale bones, with a piece of driftwood on top; some were also wrapped in animal skin or fur. 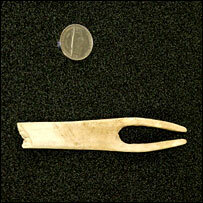 Artefacts have also surfaced, making suggestions about how people lived in Nuvuk. Here, a body holds an ulu, a traditional knife used for taking blubber from whale carcasses; there, a grave gives up weights from a bola which would have been used to hunt birds. There is armour made from whale baleen. Many of the graves also contain flat stones, which presumably have some kind of ceremonial purpose. Researchers can also call on human memory and lore, because Nuvuk retained human inhabitants until about 60 years ago. 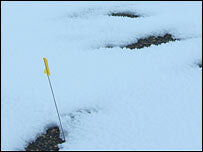 And although the houses have gone, Ukpeagvik, in the middle of what is now Barrow, has been an important site for studying remains of dwellings from the same period and culture; dwellings of impressive complexity built with subterranean cold-traps, entrance tunnels supported by whale mandibles, and insulation by sod. But what period and culture does Nuvuk represent? Clearly it was complex enough 1,000 years ago to support whaling, an activity which needs great co-ordination within the community. Crews must organise hunting, villagers must turn out for a swift butchering, meat must be stored, seals caught to make umiaq, and trading enacted to bring in caribou meat and driftwood. "I think these are very early Thule people," opines Anne Jensen. "One of the big questions is where did the Thule come from? The culture was first described in the eastern Arctic, and it's clearly the ancestor of the modern Inupiat and Inuit cultures; but where did it develop?" The Thule period succeeded earlier Arctic cultures such as the Birnirk and Punuk. 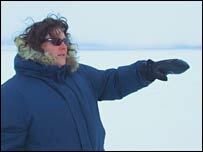 And Dr Jensen now believes she may be sitting on or close to the very first Thule settlement. "My idea is it started somewhere in northern Alaska, perhaps in a major whaling area; and it doesn't seem to stop, moving from place to place looking for whales." A community organised for whaling, she believes, would have had an edge over competing cultures. The social hierarchy and regular experiences of mass mobilisation would have made for organised defence and perhaps attack too, while a diet rich in whalemeat meant better nutrition. Laura Thomas believes you can draw a direct line between the Thule culture and the modern Inupiat, the traditional residents of Barrow and many settlements around. And the line, she says, is drawn in whalemeat. "Whaling is the keystone; it's what everything in the culture is organised around," she says. "It is the defining element of what makes 'Thule', Thule; and in modern times, what makes 'Inupiat', Inupiat." When the first bodies washed out of the sea-battered bluff a decade ago, interest was high, but funding to excavate and examine stubbornly low. That has changed; and since 2005, the researchers have received grants from Echo, a US federal programme aiming to give high school students a regular taste of real science. The students spend several weeks digging alongside researchers, which given the shortness of the digging season and the necessity of getting the bodies out fast would be described as a dawn-to-dusk job, if the north Alaskan summer had dawns or dusks rather than 24-hour sunlight. Some, such as Ben Frantz II, come back for more. "I thought it would be pretty cool to see how my ancestors lived," the fresh-faced 19-year-old Inupiat tells me. "Originally it was just a job; but as it turned out we started working on weekends and it was kind of fun, so I decided to stay for a while." Now employed as a research assistant, his main task is to catalogue artefacts - arrowheads, harpoon shafts, scrapers, tools, and sled runners. So much has been recovered that he is still working on artefacts unearthed in 2005. But, he says, it has been a worthwhile experience. "It's changed my view of my own culture. I used to think that my ancestors were really smart, but I never knew they achieved so much." As the Point Barrow bluff erodes, the rescue mission will presumably continue. Bodies will be snatched from the ocean's grasp each short summer, examined and catalogued before a new internment in the safer soils of modern Barrow. Each body is a fragment of the town's past, a reminder of the long history of whale-centred culture which binds the threads of a millennium. They are treasures which neither the Barrow community nor its modern scientific boarders are minded to let wash away.